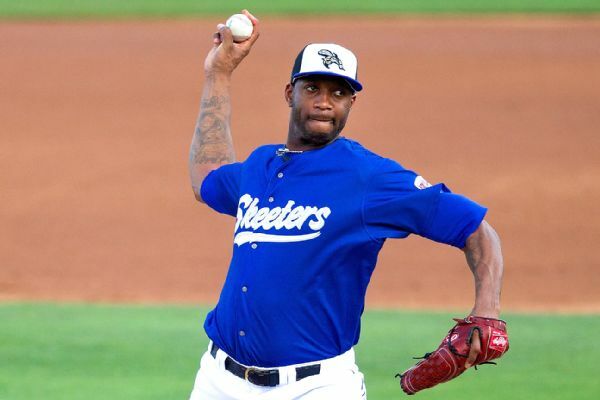 The debut of Tracy McGrady for the Sugar Land Skeeters isn’t going down in the history books of either team or player, but for someone who hasn’t played organized baseball in 18 years, it is nothing to be ashamed of for the recently retired NBA player. An All-Star and potential hall of fame inductree a few years from now, McGrady pitched for 1.2 innings and took the loss as the Skeeters lost 5-3 to the Somerset Patriots. McGrady allowed two hits and two runs before being taken off. He allowed a single in the first inning before Edwin Maysonet, a former Major League Baseball player, hit a solo home run off of him in the second inning with one out. McGrady, 34, played baseball up until the final year of high school, when he transferred to a school without a baseball program. He played for the Toronto Raptors, Orlando Magic, Houston Rockets, Atlanta Hawks, Detroit Pistons, New York Knicks and San Antonio Spurs during his NBA career. He made the All-Star game seven times and was the league’s top scorer twice.